Read below for a full list of items we accept and how to donate your used furniture, appliances, home decor and building supplies to the store that gives back! Your donations keep us building! 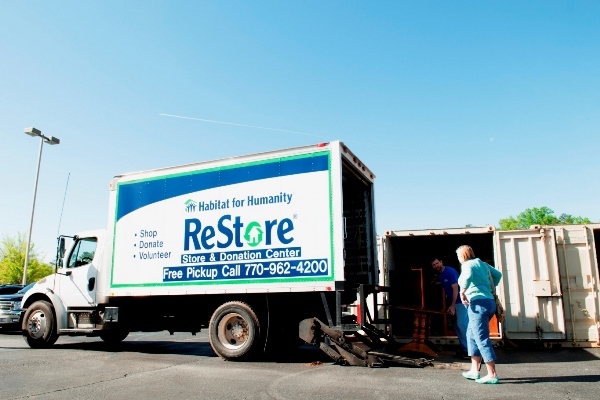 Donations made to our ReStore are tax-deductible and the proceeds support Habitat’s mission. Plus, you’ll be keeping good, reusable items in use and out of landfills. 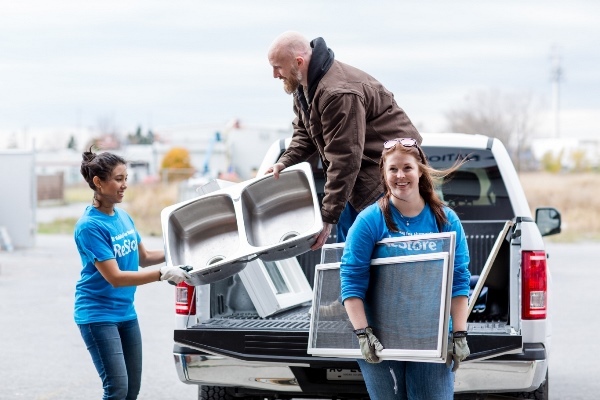 Our ReStore receive new and gently-used donations from individuals, building supply stores, contractors, home builders, interior designers, and Camden County businesses. We kindly ask that all donated items are clean, in good working order, and complete. Please note that our donations team reserves the right to refuse your donation if your item(s) do not meet our guideline requirement and guidelines may change without notice depending on our capacity. Washers / Dryers • Ovens / Ranges • Cooktops • Refrigerators • Microwaves • Air Conditioners • Outdoor Grills. Less than 10 years old, clean, in good working order, and no missing parts. Please include owner’s manual if available. Refrigeration Units • Cooking Equipment • Hood Systems • Workstations • Display Cases. Clean, in good working order, no missing parts. Kitchen Cabinets • Bathroom Vanities • Commercial Cabinetry. Must have all doors, drawers and shelves. No water damage or soiled cabinets, no missing doors or drawers. Straight counter tops in neutral colors, 10 square feet minimum. Water Damaged, no cut-out, no L-shape. Interior • Exterior • Sliding Glass (new only) • Thresholds and Weather Stripping (new only) • Door Knobs and Locks (with keys only). Residential only, 8 foot max. No rot or damaged corners, No single sliding glass doors. Plugs • Plates • Wire • Breaker Boxes • Junction Boxes • Electrical Hardware. New or gently used. Hardwood Floors • Ceramic and Porcelain Tile • Vinyl Tile • Vinyl Sheet • Carpet Remnants • Marble / Slate. Minimum of 40 square feet, must be new, never-installed. Area Rugs. No used flooring. Living Room • Dining Room • Bedroom • Home Office • Patio Furniture. Must be free of stains and burn marks with no upholstery tears or pet hair. Mattresses / Box Springs • Baby Furniture. No floral prints or particle board furniture. Door, Cabinet, Drawer Hardware • Hinges, Hangers, Connectors • Unopened boxes of Nails, Screws, Bolts. No Rust, no loose hardware. Picture Frames • Lithographs • Paintings • Wall Mirrors • Miscellaneous Decoupage. No broken parts. Dishes • Glassware • Silverware • Service Ware • Pots / Pans. Fiberglass • Wrapped • Insulation Board (16 square feet minimum). New Only. New only, no previously installed materials. Floor Lamps • Table Lamps • Desk Lamps • Chandeliers • Interior / Exterior Fixtures • Unused Bulbs. Must include all hardware and be in working order. Flourescent Bulbs • Flourescent Fixtures • Balasts with PCB’s. Dimensional, treated or non-treated (6ft. minimum) • Trim and Molding (5 ft. minimum) • Sheetgoods (1/2 sheet minimum) • Floor Joists • Porch posts and railings • Fencing. Must be new and previously uninstalled. Lumber with nails, screws, staples, painted or stained, cracked, broken or warped. Unused paint brushes and paint supplies ONLY. Kitchen and Bathroom Sinks • Bathtubs • Working Toilets • Shower Enclosures • PVC / Copper Pipes • Plumbing Hardware. Neutral colors only with no chips, dents or rust. Faucets • Bright Colored Fixtures • Unframed glass or mirrors. Corrugated Roof • Standing Seam • Shingles (New Only) • Roofing Paper (1/2 roll minimum) • Metal Sheeting / Flashing • Roof Coatings • Gutters / Soffits • Vinyl Siding in New Condition. All materials must be rust free. Hand Tools • Power Tools (must be in working order) • Ladders • Scaffolding. Power tools must be in working order and have all safety guards. Complete Window Units (double pane only) • Screens • Shutters • Window Hardware (new only). Lawn Mowers • Snow Blowers • Shovels • Rakes • Tillers • Garden Tools. Must be in working order with no missing safety equipment or attachments. Accepted: Less than 10 years old, clean, in good working order, and no missing parts. Please include owner’s manual if available. Accepted: Must have all doors, drawers, and shelves. Not Accepted: Water damaged or soiled cabinets, no missing doors or drawers. Accepted: Straight countertops in neutral colors, 10 sq. ft. min. Not Accepted: Water damaged, no cut-outs, no L-shape. Accepted: Clean, in good working order, and no missing parts. Accepted: Must be 40 sq. ft. Accepted: Must be free of stains, no burn marks, no upholstery tears, no pet hair. Accepted: Must be rust free. Insulation board, min. 16 sq. ft. Accepted: Must include all hardware and in working order. Not Accepted: Lumber with nails, screws, staples, painted or stained, cracked, broken, or warped. No scraps. Accepted: Neutral colors only with no chips, dents or rust. Accepted: Must be in working order with no missing safety equipment or attachments. Bring your reusable items to our Donation Center and make a difference in your community today! Our donation coordinator will walk you through the entire donation process with you.